Thank you for visiting the Home Page of the Southern Nevada Living History Association. Please read our about page to learn more about our organization. Please read our CONTACTS page to send us an email about joining or arranging a special program. 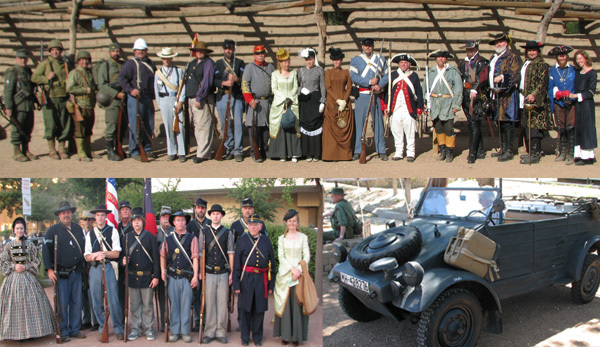 We provide the Local Las Vegas area with Re-enacting and Living History primarily focused on the American Civil War. We are an Organization designed to promote History through Reenacting and other methods. We function in Association with other Organizations involved in the preservation of History, and band together to support local events. The SNLHA also supports other Historical Reenactors from history, like Roman Legionnaires and World War II soldiers. Living History each month down at the Old Mormon Fort State Park. Please see the "Event Calendar" regarding our meetings and events. We are constantly looking for new members, and are more than willing to train those with little or no experience. Please send us an email via one of the links on our contact page so we know you're interested! Thank you!